Designed to help new writers find answers fast, The New Writer’s Guide features more than sixty sections, providing essential advice on a wide range of topics. Advice on developing ideas, the craft of writing, techniques for editing, basic rules for submitting work, and even a little bit of philosophy about writing, for good measure. The style is practical and encouraging, like a friendly chat with a fellow writer. Most articles end with a Do it! prompt, so you can work on applying what you just read right away. There’s a writer’s quiz, a glossary of writing terms, a new writer’s FAQ, recommendations of books, software and websites, and fifty writing prompts to get your creativity flowing. And, as a bonus, a guide to conducting your own personal workshop to improve your fiction manuscript. The e-book is 115 pages and is available in .pdf format (for Adobe Acrobat Reader) for $8.95US. New writers interested in getting their writing careers off to a fast start can download it instantly from Booklocker.com‘s secure ordering site. It can also be ordered directly from the author via sherry@thescriptorium.net. If you are a new writer or thinking about trying your hand at writing, this is one book you should have. And to the writer who is no longer an amateur, this book also can provide a refresher course of ‘back to the basics’ that we all need on occasion. 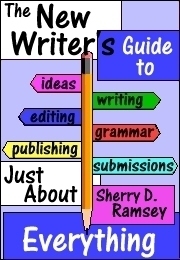 The Guide covers all aspects of getting started and offers very good advice regarding the process of writing. Sherry D. Ramsey has researched the ‘how to’s’ to save her reader a great deal of time. The information is well organized, leading logically from one step to the next. The advice contained in this book can be applied to any genre, fiction or nonfiction, article or story. It gives the new writer a down-to-earth look at the publishing business and writing in general. Excerpts from The New Writer’s Guide to Just About Everything have appeared at A Writer’s Life.net, The Published Writer, Christian Bookcase.com, Wordweb, Footnotes, Writers Manual, Inspired2Write, and Creative Babe. Canadian writer Sherry D. Ramsey’s first writing love is speculative fiction, and her short fiction works have appeared in print and online. “The New Writer’s Guide…” grew from her experiences editing and publishing The Scriptorium, a monthly online magazine offering a wide variety of resources to help beginning writers get started on their writing careers.